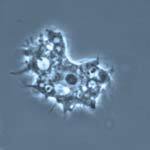 Acanthamoeba keratitis is an inflammation of the cornea caused by a microbial parasite. It is the most common form of microbial keratitis found in contact lens wearers. Studies have shown that among contact lens users, acanthamoeba keratitis is most prevalent in those who use soft-wear daily lenses. Symptoms of acanthamoeba keratitis include redness and pain in the eye, difficulty opening they eye as a result of pain and irritation, sensitivity to light, blurry vision, light sensitivity, and a feeling that there is foreign matter in the eye. Swelling, discharge from the eye or excessive tear production are other signs of eye infection. Fungal keratitis and bacterial eye infection can cause the same symptoms. People who have even mild damage to the surface of the eye are more likely to develop keratitis of one kind or another. People who take immunosuppressive medications to control autoimmune disease, those whose immune systems are compromised by disease or chemotherapy, those who take steroids, and contact lens wearers are all at greater risk for developing keratitis. People who live in humid, warm climates are also at higher risk. Plant material that gets into the eye can scratch the surface of the cornea. Naturally occurring plant chemicals may cause inflammation. The inflammation can lead to infection of the eye. Contact lens wearers can reduce the likelihood of developing keratitis by following these simple tips. Make sure you disinfect your lenses properly. Do not wear contact lenses longer than your doctor recommends. Do not wear contact lenses during swimming. Do not use homemade solutions or water to clean your lenses. If you use daily wear contacts be sure to remove them before you go to sleep. Whether you have acanthamoeba keratitis or any of the other forms of this disorder, you should not attempt to use home remedies for eye infections. Eye infections are serious. Some of the complications that can result from untreated keratitis are swelling and scarring of the cornea, reduction in vision either temporarily or permanently, inflammation of the cornea that becomes chronic, recurrent or chronic corneal viral infections, and even blindness.